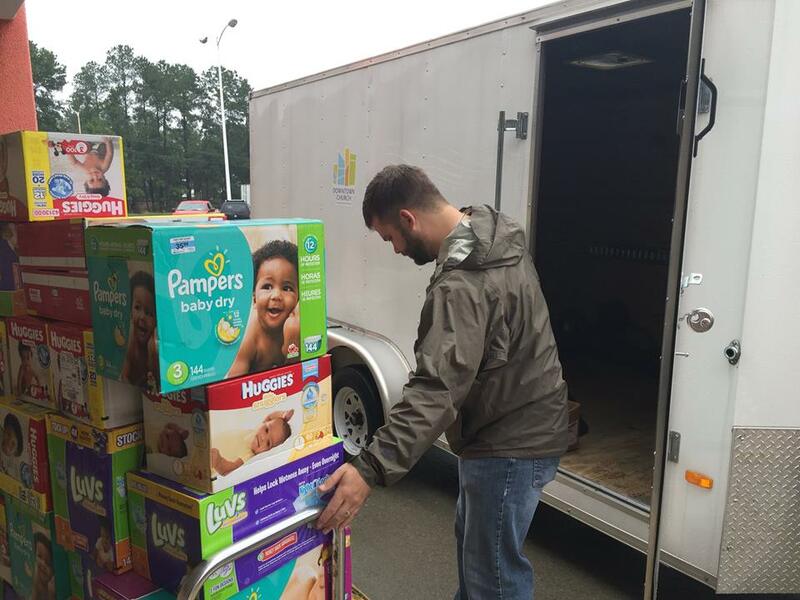 Two days after the flood in South Carolina, October 2015, Downtown Church (DTC) in Columbia, SC started a fund to purchase diapers, wipes, baby food, and formula for victims of the flood. The first gift to that fund was $8,000. Our initial expectations were limited. All we knew was this: we had to do something, take action, and offer what we did have to those who didn’t have anything anymore. We unloaded the contents of our church trailer into the church office and filled it with supplies we’d purchased. As we made our first round to three local shelters, we quickly heard about other needs, such as hot meals. So, we committed to prepare and serve breakfast every morning at one shelter. Shanna Sheppard stepped up to coordinate the purchasing and cooking, and our DTC community quickly filled seven volunteer spots from six to eight o’clock every morning for more than a week to make this happen. As each day passed and we spent more time talking with families and individuals displaced by the flood, our mission expanded. It seemed like each day we uncovered an additional need. And when we asked our community to step up, they did, even when it meant washing 140 loads of laundry. People were just as generous with their donations as they were with their time, more generous than we anticipated. Within two days, $8,000 became $20,000; and then $20,000 became $35,000. All along, we were learning new things about the complexities of escaping poverty when it is exacerbated by unexpected crises. We were also humbled by the fact that no matter how much money we raised or how many times we visited the shelters or how angry we became watching real people with names and stories get lost in a system that anyone—rich or poor, dry or wet—would have a hard time navigating. Because it was obvious that we cared and we could get things done, we were frequently called upon by institutions and individuals to meet whatever short term needs developed. Within days, we were stretched beyond our capacity and we realized that no amount of socks, undies, or hot breakfast plates would create real change. Without a more defined scope, we would end up serving no one and wearing ourselves out. We paused to consider how we could channel our funds into a more permanent and sustainable solution that would fill a gap in a system we were only beginning to understand. But that wasn’t our only goal. We also wanted to find a way to continue to engage our Downtown Church community in the mission. 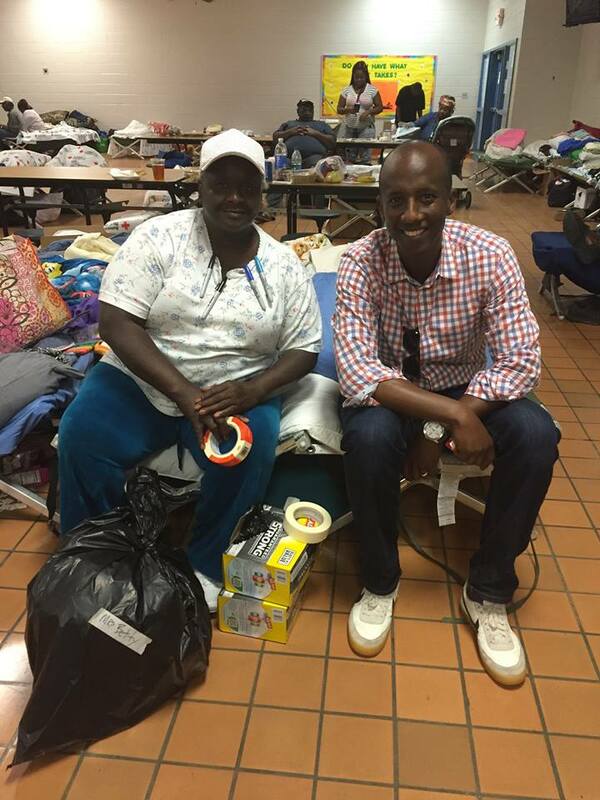 Our goal was to purchase and furnish two units of housing for households displaced or directly affected by the flood. There is an insufficient supply of affordable housing in the midlands. After emergency shelters close, people have nowhere to go while they wait for their homes to be renovated. This is especially true for those who were already vulnerable prior to the flood. There is no “one size fits all” answer to a mission of this kind. We knew the paths we walked with households would be as varied as the households themselves. That meant that our measure of success was largely qualitative in nature, not a fixed target. We didn’t know how long each household would need transitional housing. Ultimately, it was this transition from temporary to permanent housing that would be one of several indicators of success. Another less obvious, but just as critical, indicator was that the people of Downtown Church were challenged, nurtured, and encouraged in their faith journey through this partnership. First and foremost, we realized that we wouldn’t get anywhere without a smart, motivated, experienced program manager leading the way. And, we were both excited and confident that we found the right person for the job. Danielle Allen, otherwise known as our Counselor-in-Residence at Downtown Church, accepted the role of program manager. Her responsibility was to lead us through purchasing and furnishing two transitional residences and offering them, for a short period of time, to households displaced by the flood. Downtown Church is not a disaster relief organization. However, through our conversations with members of households that could be supported by a partnership like this and with individuals who have professional expertise and experience, we were confident about the need for transitional housing and our capacity to do something about it. Our support of these households didn’t stop there. We worked closely with individuals to leverage our access to material and financial donations and networks to support them. This partnership was designed to foster accountability and encourage individuals and families to step into a place of empowering themselves as they made their way to a more permanent housing arrangement. In the beginning, we had hoped to purchase property and make housing available to families in need. 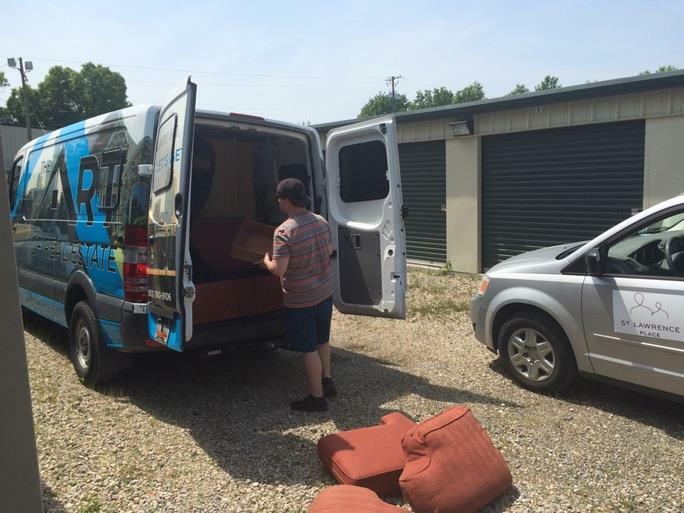 We gathered enough furniture to comfortably fill at least two houses. During this time, we also researched best practices and met with other organizations doing similar work. After identifying properties and making offers that weren’t accepted, we decided to take a second look at our strategy and decided to provide short term/rapid rehousing (based on a popular HUD model) instead of purchasing homes. This would allow us to quickly take action in supporting the families we had identified as partners in this process. The Downtown Church Session and staff agreed that we wanted to support families who were excited about engaging in a long-term partnership to create relevant and significant change in their lives. This kind of change would require not only financial support and donations, but also time and commitment from our congregation. On October 4, 2015, about four in the morning, a mom and dad awoke abruptly to find a pool of water in their bedroom. They managed to escape rising floodwaters by using the mattress they were sleeping on to reach safety, but they immediately thought of their little boy who was staying with relatives in another town. Hard working parents, mom and dad were doing what they could to provide a good life for their family. Mom drove a delivery truck and dad worked in the restaurant industry. But some memories are hard to shake and an experience like theirs would be traumatizing to anyone. Mom now has a hard time when it rains, and really with water in general. It is difficult to work when you can only drive when it’s not raining; it has rained a lot lately. But she is keeping her head up and getting help. While this the family was able to pay rent, all of their belongings were ruined in the flood. They were using candles to light the house, a fire hazard and especially when a five-year-old boy is in the mix. Through generous donations, we were able to provide some lamps, kitchen supplies, much needed clothing, new shoes for the parents, and a small TV. The young boy already had some new Christmas toys thanks to an Angel Tree at his school. The parents were sharing a car borrowed from a friend. However, we were able to meet this family’s need for reliable transportation by purchasing a used vehicle for them. Mom signed up for a class at Midlands Technical College to complete certifications that would make her both employable. As we reflect on our experience during the flood, what comes to mind is the way that our community came together and stepped up to help in big and small ways. Whether it was bringing in socks and t-shirts, cooking breakfast, or doing a stranger’s laundry, everyone was willing—and wanting—to serve those who had been affected by this natural disaster. We’ve grown closer as a community by stepping up together to help our neighbors in need. Downtown Church is a PCUSA congregation. It is a community of unfinished people, worshipping together in Columbia, SC. You can learn more about Downtown Church on their website: downtownchurch.me. Jeannie Sullivan—MVP, Downtown Church. Jeannie is a utility player who steps in to take on projects as they unfold and helps to manage the DTC website. As a professional coach, consultant, entrepreneur and innovator, her goal is to help DTC move from a church that started to a church that will be around long enough to fulfill the vision that compelled its initial formation. Basically, she does whatever, to make the church better. Over the span of her career, Jeannie has provided learning strategy and change management expertise in a variety of industries including manufacturing, financial services, pharmaceutical sales, software development, transportation and health insurance.